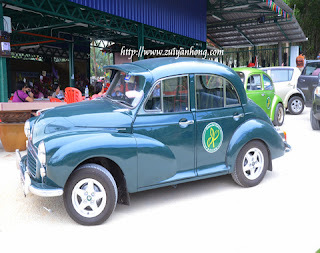 Besides fruit trees, there were two antique cars displayed at Jasin Selandar Farm. The cars reminded me of an old joke on Volkswagen. The owner of a Volkswagen was very surprised when he discovered his vehicle's engine was missing. He called a mechanic to repair his car. The mechanic opened the rear cover of the Volkswagen. 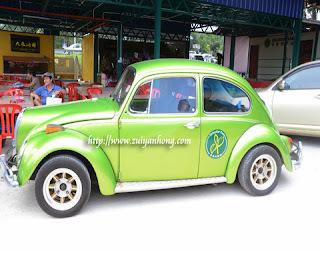 The owner whispered to himself, "Luckily Volkswagen is different with Malaysia TUDM jet." Based on a logo at the front part of this car, it's a British manufactured automobile, "Morris". I had no idea about the model and date of manufacturing of this Morris. I was unexpected to see these two antique cars during my visit to Jasin Selandar Farm.